We Loved our stay, even with Hurricane Lane! It was great being so close the beach especially when the waves were kicking up during tropical storm Lane! We have never been in Hawaii when a big storm was closing in and was glad when it was down graded to a tropical storm. Our accommodations were great! We especially loved the reclining coaches and being on the ground floor. Having such great access to the beach and pool and especially the barbecue area is ideal. We had friends that stayed in the garden court and they wanted to spend all their time with us. Very nice and relaxing. The condo is very comfortable and there were boogie boards, noodles and beach chairs to make our beach excursions that much more enjoyable. It was also very humid as a result of the storm and we made good use of the two large fans to keep us cool. I would love to come back and stay in our same condo! Relaxing Maui family getaway! When we were looking at condos for our Maui trip, one of the things that sold us on this property was the video. I have to say that in real life it was even better! You can be walking on the beach in literally less than a minute, and the access to the long stretch of Sugar Beach was wonderful for beach walks! Watching the sun peek over the shoulder of Haleakala every morning was an amazing experience, and even though you cannot see the sun dip into the ocean at sunset from this point in Maalaea, the evening colors over the city of Kihei and the mountain were spectacular! I found a very nice reef area not too far out from shore for some really nice snorkeling, and the entire area also was wonderful for boogie boarding! Many have commented on the winds in this area of Maui, but we found this to be nothing but positive! The steady breeze kept the humidity reasonable and the weather, although quite warm in early August, was very nice! With the nice breezes and the fans that are provided, we rarely needed the small A/C unit until the last couple of days when the trade breezes stopped (due to the highly rare proximity of a hurricane to the neighboring Big Island) and the humidity rose. The small A/C, with the help of the fans, kept the condo wonderfully cool and comfortable during this time. I will also comment that we found the Maalaea area to be a nice quite relief from the noise of Kihei, Lahaina, and Kahului. This areas central location made getting to different parts of the island easy, and driving to different grocery stores (and the very close farmers market!) was extremely convenient. The condo is very well furnished, the beds are comfortable, and we enjoyed cooking almost all of our meals here. I highly recommend this condo to anyone, especially families, who may be considering a Maui vacation! Perfect, quiet location, steps from the beach. Great location right on the beach. Quiet family oriented location. Two mile secluded beach at location. Excellent !! This is my second time staying at this complex. I was in the condo next door last time. My kids and I loved it. Snorkeling and swimming right outside the door and miles of beach to walk. We watched whales and turtles from the lanai. It's low key and quiet which is right up my alley and centrally located on the island. I'll be returning here next year. Great location and exactly what we expected It was our first trip to Maui and we weren't sure what to expect. We found the condo to be EXACTLY as the video and photos showed. It was clean and the management team was quick to respond when we needed help with one of the TV's. It was wonderful to hear the waves crash every night as we slept. The view was spectacular. Parking is a bit tight, but most of the time we found spots close to the condo unit. The pool is a bit blah for kids, but we found we didn't spend much time at the property. The supplies provided; chairs, boogie boards, towels were really appreciated. Really thankful for the two twin beds in the second room too, very handy for our kids. Thanks for making our winter vacation a HIT. 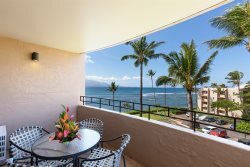 It was a great stay, we did enjoined Maui, we did enjoined this condo. Everyone was extremely accommodating and wonderful to work with. No problems at all. Loved it! Can't wait to come back.